Did you see what I did there with that little pun? Okay, it was cheesy, but so many Palm Desert residents are opposing horses as their neighbors. According to a recent article in the Desert Sun, Palm Desert residents are angry that the city is allowing horses to be kept on nearby property. Many residents say it's too close to their homes and have taken their concerns to the City Council. However, councilmembers found the permit allowing horses lined up with the zoning for the property on Delaware Place and unfortunately, the Council voted unanimously to uphold the decision that the planning commission made in March about the zoning. An administrative use permit was issued in January by city staff and in February, residents to the north of the Delaware property filed an appeal citing concerns about the odor, flies, other vermin, and dust. Many residents don't want horses less than 100 feet from their backyard swimming pool. Residents feel it's a health and safety issue, especially those that are concerned with the dust and vermin. Councilwoman Kathleen Kelly said those concerned are assuming a worst-case scenario. "There is really no factual basis to fear that the presence of horses is going to cause more dust than the lot has caused without the horses." 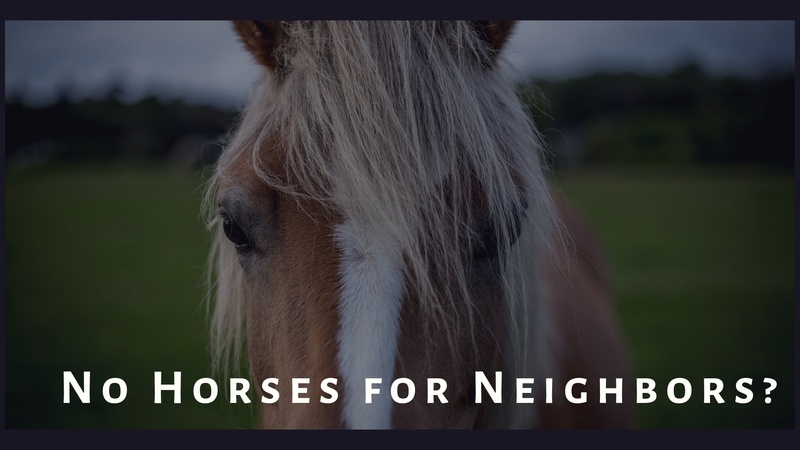 The permit requires that horses must be at least 100 feet from the northern property line and that the stable be ventilated and maintained with groundcover to prevent dust. It also states that any barn, stable, or corral be cleared of feces at least once a day and the maneuver stored in fully enclose receptacles, which will be properly disposed of at least once a week. Currently, those conditions are being met and are designed to avoid a worst-case scenario. However, Kelly also says that this is not a one-size-fits-all city. We want the wealthiest and everyone else to have access to all amenities that ensure a good life for all. This can include preserving some space for larger lots to accommodate a limited number of horses. So whether you're looking for a horse property or far from it, give me a call or start your online search for free on my website. We can help find the right home for you or your horses.